I think there are just a couple of seats left for our upcoming Holiday Watercolor Workshop at West Elm OKC. We will be creating all kinds of holiday goodies. I'll briefly cover brush lettering and watercolor basics, but most of the time will be spent creating some great giftable items! Interested in hosting a workshop at your boutique or home? I'd love to help. Contact me for more info and availability. All the lovely gals from Paper Society OKC and I could NOT be more excited about our upcoming shows. We've been working hard getting products printed, packaged and displayed. We've been having brainstorming sessions and super long email conversations with to-do lists out the wazoo. And we have been having SO. MUCH. FUN! We can't wait for you to join in on the fun at our first joint shows, coming up Small Business Weekend! 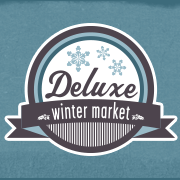 You can find us at the Holiday Pop Ups Nov. 27, 28, 29, and Deluxe Winter Market Nov. 28, 29. More details and links to the events are below. We really really really hope to see you there. We have so many delightful items that make great gifts or add the perfect finishing touch to your holiday gifts. Learn more about the Paper Society crew at www.papersocietyokc.com. Nov. 28 + 29, opens at 11 a.m.
Nov. 27, 9 a.m. - 9 p.m.
Nov. 28 - 29, 10 a.m. - 9 p.m.
Oh, and...if you're in the Tulsa metro-area, come shop at The Backyard Market in Broken Arrow! I'll be set up 11 a.m. - 3 p.m. on December 12, at Restore House in BA! Check it out, here! I'm focusing more on generosity these days, and as each day passes, I find that generosity and gratitude go hand in hand. They feed off of each other and enhance each other. When we take time to recognize what we do have, we are able to see ways to give back. It's hard to be generous if you're working from a place of scarcity. So, in order to be more generous, I want to be more grateful, too! As an entrepreneur, I sometimes get caught up in lies like (and tell me if you can relate...), I'm not doing enough, or I should be further along, or Oh my goodness...look at ______, she is killin' it! I forget to look at what I have accomplished and the good things going for me. I forget that I've got A LOT to be grateful for, and A LOT to be proud of. As a reminder to myself, and to give you a glimpse into a little bit of what I do outside of Frameworthy Designs, here's a little gratitude collage. Community. S'mores. Breakfast food. Workshops. Craft Shows. Meeting Bob Schieffer and Jim Lehrer. Star Costume. More Breakfast food. Not pictured, but just as great: Yoga classes. Watching The Price is Right with my eclectic 'family'. Hanging out with a super cute baby. Cooking meals (that aren't breakfast). Counting inventory. Reading. Trying not to like The Walking Dead. Making this collage was super fun, and I encourage you to create one too! Remember, gratitude and generosity complement each other, so let's embrace them both. And in case you missed it, check out my last post to learn how Frameworthy Designs is giving back. When Boo and I first started dating, we spent some time with his extended family in Oregon. (I wrote about it here.) It was my first time in the Pacific Northwest, and now my 'happy place' is filled with giant trees, sand dunes, and sea mist. The bite of cool, wild air is still so vivid. But there's a warmth that cuts through the chill of ocean air...the warmth of generosity. I distinctly remember the welcome, the ease, the embrace his family gave me. I remember the chats about faith and video game battles and late-night pizookies. I remember the home-cooked meals and the family outings. And I remember how we noticed, Mark and I. We took note of that generosity, and we made a deal: we would be generous to a fault. Someday, we said, we'll open our hearts and home. We'll cultivate community and give our time and talent. We'll be financially generous. We'll give until it hurts. It's been just about two years since that trip, and that phrase, generous to a fault, still pops up in our conversations on a pretty regular basis. We give in the small ways we can, but we can do more. Always. I know I'm not always generous... I know I can be grumpy and sometimes I fiercely guard my time...but generosity is a virtue I sincerely desire, so I'm going to start working on it. TODAY. So, I'm really excited to announce that starting today, Frameworthy Designs will donate a portion of each sale to Unbound's Microfunding programs. Unbound is an organization that I've donated to for few years. I sponsor a little girl, Reyna, from Peru. We exchange letters and I get to see her grow up through pictures. It's super rewarding, and the organization makes giving simple. You can sponsor a child, teen, or adult monthly or you can make one-time, targeted donations to specific needs like health, shelter, and microfunding. Read more about the effort here. I'm also going to emphasize the theme of generosity in my social media efforts, and I'd love it if you'd join me. I firmly believe that like attracts like, and generous hearts are no exception. When we notice those people in our lives that extend generosity to us and others, we become more aware of opportunities to be generous as well. Tag @frameworthydesigns in your photos on Instagram and use the hashtag #frameworthygenerosity. I can't wait to hear your stories!